this week is to take an image of those background stars now. Where are you going to be on that date and which background stars will be visible then? We will be in Casper Wyoming for an astronomy conference and of course experiencing the total solar eclipse. Now I know that many of you are planning to be in other locations on that date and even for all of you that remain here in southern California, you will still be able to observe a partial solar eclipse. Check out this Sky Safari Pro screenshot which shows the location of the sun and moon as it should be observed, not on the line of total solar eclipse, but from the observatory location here in southern California. Note that the moon does not totally block the light from the sun, but it should still be a pretty neat event right here. 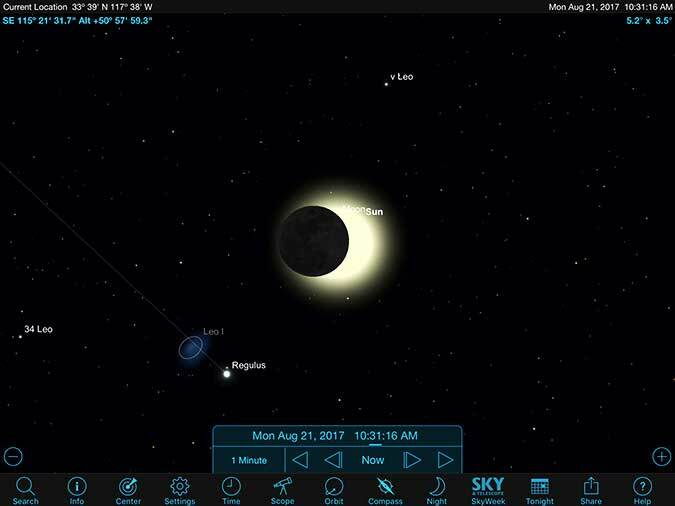 If you are at the total solar eclipse path that crosses the whole United States and passes directly through Casper, Wyoming, the moon will completely block out the sun and only the dimmer solar corona will be visible from those locations. The important thing for this observing plan is to note where on the sky the eclipse is found. It is in the constellation Leo and the brightest star in Leo is Regulus, which shows up at magnitude 1.4. So, it turns out, as you know, that even though Leo is up in the daytime in August, it is up at night now. Wow, ok, better get on this and collect an image of the stars in Leo now that are visible at nighttime. Oh, oh, the weather has not been cooperating very much to accommodate amateur astronomers. It has mostly been accommodating us physicist wannabes by keeping us inside at night studying. So, one of the topics I was reviewing was how much the light from a star would be bent by the gravity of the sun. Well, if you check out the gravity book I recommended in the last post, "A Most Incomprehensible Thing" by peter Collier, you can find how to calculate the amount of deflection. In chapter 9, he summarizes he long mathematical formulation of the problem with the summary formula for calculating the deflection as equal to 4*G*M/(b*c^2), where G is Newton's gravitational constant, M is the mass of the sun, c is the speed of light and b is the impact parameter, which is just a fancy name for how close the light beam comes to the sun. In our case, we assume the light beam just grazes the surface of the sun, so b will be he radius of the sun. Now if you carry out the calculation and convert the deflection to arc seconds we find the deflection to be just 1.75 arc seconds. So if it happens that the test star is two solar radii away from the center of the sun, the deflection would be just 1/2 of the 1.75 arc seconds, still pretty darn small. 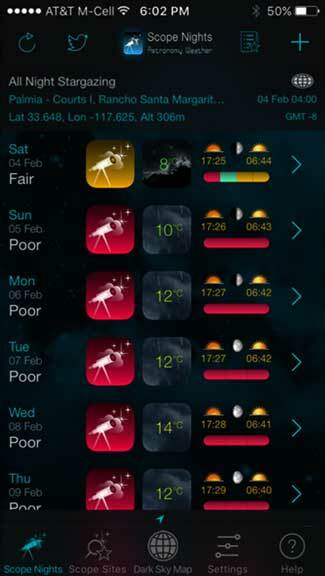 The forecast for this week has been for clouds and rain, but look at the one glimmer of hope in the Scope Nights screenshot below. Wow, a whole lot of red indicates poor observing conditions. See how for Saturday night, only, there is just one little point of time where the clouds will be gone, indicated by the green in the timeline, for a couple of hours just before midnight Saturday. Ok, if that is the only time available this week, let's go for it. I took Astronomer Assistants Danny and Ruby out for their walk around the observatory grounds about 9:00 pm and boy, it did not look encouraging. But, when I took another peek out a little after 10:00pm, things started to look much better. It seems that narrow opportunity forecast was actually going to occur. So, I grabbed my tripod, already with the mounted camera and 300mm lens, and set up outside in about 5 minutes. My GoSkyWatch IPhone app helped orient where I should look for Regulus and luckily this time there were no clouds at that location. Actually, the setup time took a little longer because I had to go back inside to get my astronomers chair because Regulus was so high in the sky that I couldn't bend low enough to sight it in. With the chair in place, I used the red dot finder to point at the brightest star I could see in the location where Regulus was supposed to be and took some images. 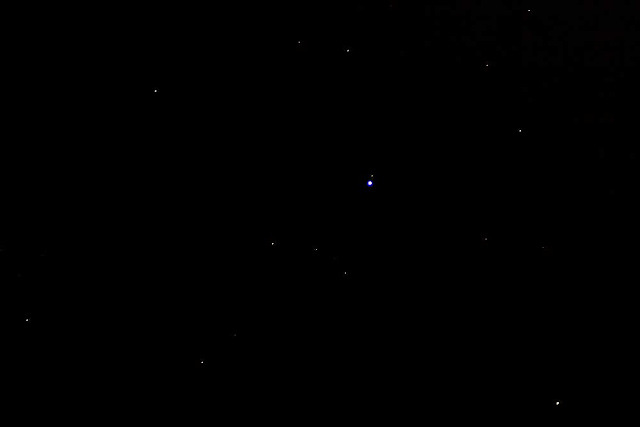 Regulus could be seen in the camera Livescreen and I took several images with exposures ranging from four seconds to 1/8 second. 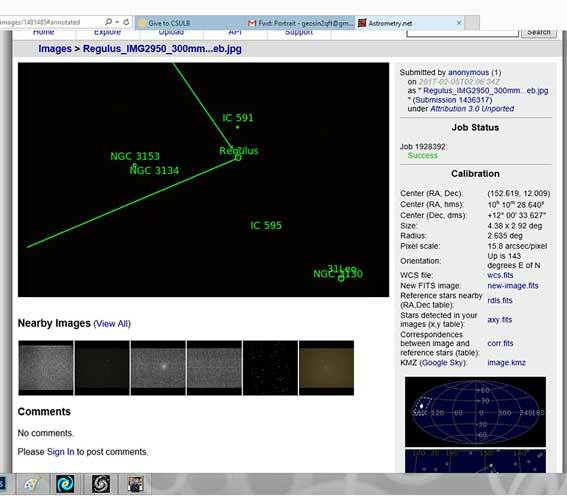 Ok, I thought I had found the correct location for Regulus, but to be sure, I uploaded the image to Astrometry.net to get confirmation that Regulus was indeed in the camera frame. See the confirmation page below. Note also that the measured angular size of this image taken with the 300mm focal length lens is 2.92 degrees by 4.38 degrees and that the pixel scale is 15.8 arc seconds per pixel. So if this represents the total angular resolution possible then it would be hard to measure a deflection of 1.75 arc seconds. But this is not the actual limit that fits my image. First of all, the image uploaded to Astrometry.net was a small JPG file and it represents about 1/4 the actual pixel resolution that I can achieve with other software. Also the software can do sub-pixel resolution so effectively I should be about to achieve about 4-6 times higher resolution or effectively about 2-3 arc seconds. But do I think I can make a measurement to confirm the deflection of light? No, not really, there is just too much uncertainty. But it is the case that for amateurs that use longer focal length, say 2100mm, which is 8 times longer, their angular resolution of stars should be much closer to being able to verify the prediction. Of course, if one actually tried to do this then other corrections would also probably be needed to be applied. Anyway, my intention is just to try to duplicate parts of the data acquisition and verification process and have fun doing it. 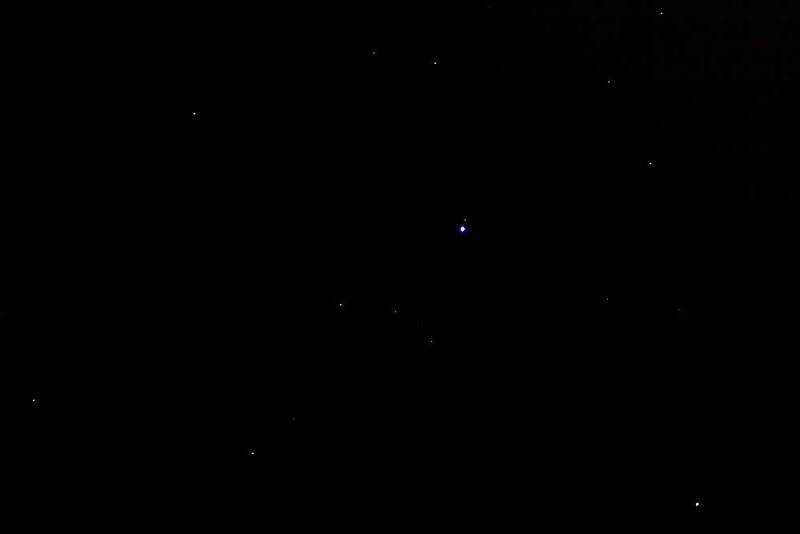 So my 2 second exposure of the background stars around the star Regulus, in the constellation Leo, is shown below. At 2 second exposure, Regulus is definitely overexposed, even over exposed at 1/2 seconds, but the plan is to be able to see dim stars near the limb of the sun, so some saturation can be allowed in this case. My plan is to still compare the locations of these stars with those taken during the August 21 eclipse and just see what can be measured. It should be fun regardless of the outcome. So that is about it for this post. Resident Astronomer Peggy and I just returned from the market with a bottle of champagne to toast the winning Super Bowl LI team. We don't really care who wins as long as we get to toast the winner. That sounds like a winning approach no matter what!